BMW is busy planning its future lineup of electric vehicles and photos of its latest concept, the BMW Vision iNext Concept, has leaked a little early. Its face is a lot to look at, but the rest of it looks like a pretty cool future crossover. But, as you can tell from the photos, the iNext is a super-conceptual version of what’s likely going to just be a relatively normal-seeming electric crossover, kind of like the new Mercedes-Benz EQC or upcoming Audi E-Tron, except the iNext should be a little more advanced by the time it hits the market in 2021. On the outside you can see it gets a light up smushed kidney grille that doesn’t seem functional, a light-up rear diffuser-like design, and a giant glass roof panel. The rear end is much easier to look at, with thin stretching taillights and very flared fenders that give it more of a sporty impression. From the photos you can see the interior has two widescreens mounted to the dashboard and features a funky blue cloth on the seats and various wood trims, including a cool diamond pattern on the front armrest. The pedals also appear to be flat to the floor. 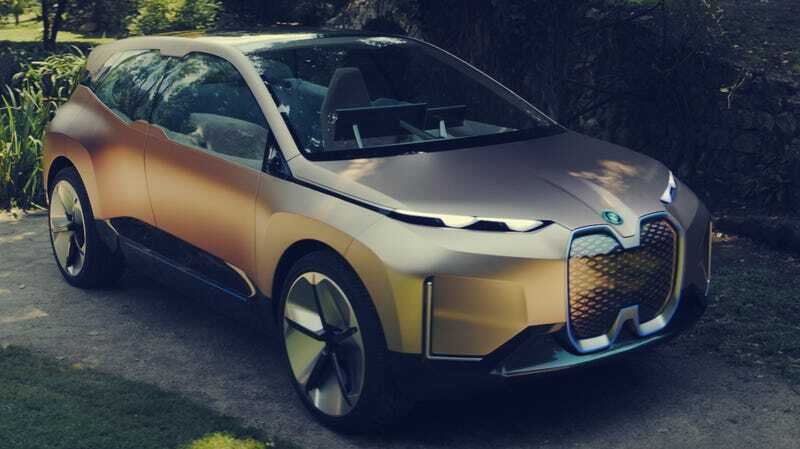 It looks like a modern, spartan place to be inside, and the whole design translates as an obvious progression of what BMW has already done with the current i3 and i8 hybrid and electric models. I just wish they did something... else with the grille. Literally anything else.